I found that Pam at Sidewalk Shoes has a beautiful pesto recipe. I have tons of basil right now that really needs to be used. This is the first time I have made pesto. It's easier than I expected. I can't wait to make more! I didn't have any pine nuts though so I had to leave those out. I also added some fresh squeezed lemon juice to my pesto. 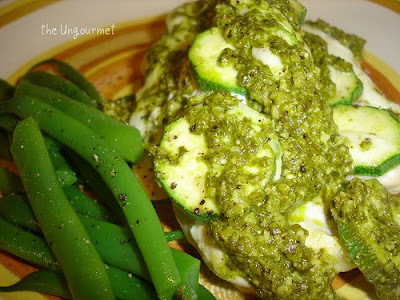 You must go visit Pam and see her Pesto Post. It's incredible and her pictures are gorgeous! I decided to use my pesto in this baked chicken recipe. I also used some zucchini and green beans from my garden. I can't tell you what a blast I'm having running out each day to grab things for dinner. I'm hooked on this gardening business! Marinade the chicken tenders in 1/2 cup fresh squeezed lemon juice, salt and cracked pepper for at least an hour. Place chicken in a lightly oiled baking dish. Top chicken with zucchini slices, mozzarella, and pesto. Crack a little black pepper over everything. Cover with foil and bake at 375 degrees for about 35-40 minutes until chicken is cooked through. This was a perfect dish for today. It wasn't too heavy and it had a wonderful fresh summer flavor. My husband said it was terrific as well, so I will definitely be making it again. Pesto chicken - yum! I just thought I would let you know that I made your greek flatbread wraps again tonight. They are my favorite - Thanks again! Pesto presto!!! I alwasy say that whenever pesto is involved. Looks great with the chicken. Definitely a wonderful combination. Btw...I gave you an award that will be posted tomorrow. Thought I'd tell you ahead of time. The pesto looks just wonderful! I've never had pesto...but I grew basil in my garden this year just so I could make it and try it! :-) It's not doing too well... I hope I'll end up yielding enough to experiment! 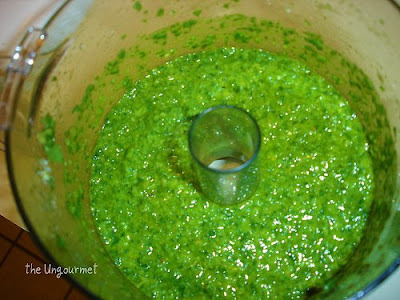 I love that bright green color, pesto is the best! Lovely! Kim, what a lovely meal. I'm sure it was delicious. I love homegrown basil for pesto! For whatever reason, fresh basil here is hard to find at the store - the only way to get it is to grow it. I made pesto for the first time last year. Love it! If my basil weren't failing so miserably this summer, I'd be making it again. The chicken recipe looks really yummy! Good pick! Pesto looks so yummy! Especially with fresh herbs right from the garden. That is the best. The chicken is mouth-watering! So delicious. There are few things in life I love more than pesto and pine nuts. BUT, I have never made my own! I might just have to try it! Your pesto looks so nice and vibrant! It's just such a versatile condiment, goes well on everything! Look at that vibrant green, only something one could achieve from having basil fresh from the garden. Lucky you! This looks good! Hey! Thanks for trying my pesto! Your recipe sounds like a great way to use it. I have tons of basil, too that I have to use up. Pesto plus lemon juice sounds great! That looks so delish. J'adore pesto!